Hippodrome was built when the city was called Byzantium than during the reign of the Roman Emperor by Septimus Severus in the 2nd century it was rebuilt and was expanded to colossal dimensions under Constantine the Great. It was the centre of Byzantium’s life for 1000 years and of Ottoman life for 400 years. The seating capacity of this enormous arena is more than 60.000. It was a social centre of Constantinople. Entertainments, amusements, musician’s- dancer’s- acrobat’s -animal trainer’s performances and sports were arranged here. Hippodrome means Horse square (in Turkish At Meydani). 2 or 4 horse chariot races highlighted each day’s program. Chariots drawn by either 2 or 4 horses raced here representing one of the four political groups. Each group was represented by a color. Later on these four colors were united in two colors; the Blues and the Greens. The Blues were the upper and middle classes, orthodox in religion and conservative in politics. The Greens were the lower class and radical both in religion and politics. One of these political divisions ended with a revolt which caused the death of 30,000 people. This revolt was named after people's cries of "Nika" which meant "win" and this Nika Revolt took place in 531 AD. After the invasion of the Crusaders it was mostly destroyed. Later, During the Ottoman period the Hippodrome grounds were used for festivities and ceremonies. Today only 3 monuments are survived in this magnificent arena and the area is officially called Sultan Ahmed Square. It has never been systematically excavated by archaeologists. They are 2 obelisks and Serpentine Column. During the Ramadan the Hippodrome turns into a giant block party upon sundown. Muslims break their fast in Hippodrome. There's plenty of food, merchandise and, given Turkey's secularism, even some alcohol. It's a great opportunity to see real people here at that time. 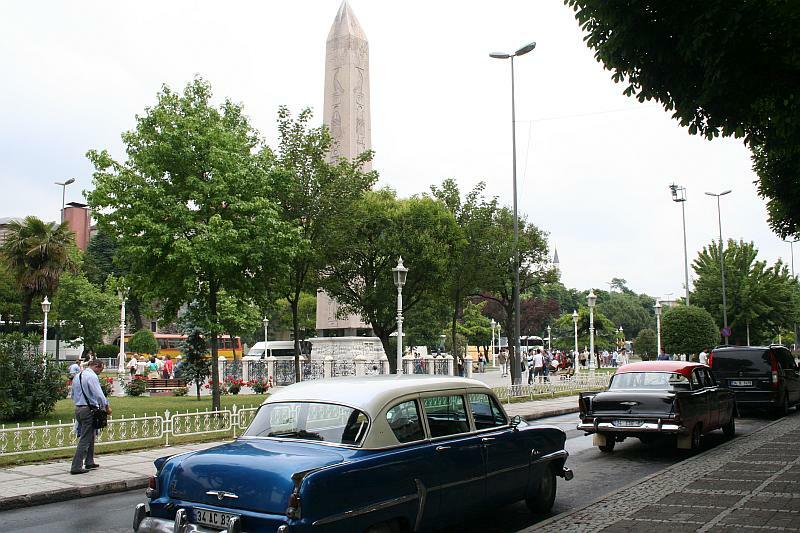 The Egyptian Obelisk: The Egyptian Obelisk is the most ancient monument in Istanbul. It has 25,60 meters high. Obelisk is decorated with reliefs of emperor, his family, important people watching the races, musicians, dancers and chariot races. It was carved in Egypt in 1450BC and made of exceptionally high quality pink granite then erected around 1490 BC by the Pharaoh Tuthmosis III to commemorate the victories of his armies in Mesopotamia. During the 4th century it was brought to Istanbul with the order of Roman emperor who wished to stage an event that would demonstrate his power and hence excite and impress his people. But until 390, for a long time, it was left lying in a corner of Hippodrome. It was erected during the reign of Theodosius I with great difficulty by Proclus (administrator). The Walled Obelisk: Unfortunately its exact date of construction is unknown. In 10th century it was repaired and named by Constantine VII. It has 32 meters high. A sphere at the top of it and bronze plates which covered it was stolen by Crusaders and melted to mint coins. Serpentine Column: it is at least 2,487 years old and 8 meters high. It is also known as spiral column. Originally it was topped by three serpents’ head and much taller. Constantine the Great had it brought to Constantinople around 330AD. 3 serpents’ heads survived till 18th century but now you can see remains in the Istanbul Archeological Museum.